Pass. Rejection. No thanks. A bigger plan. I thought about PULLING HOME for almost thirteen years before I got it right. I remember pitching the idea to an editor in Kentucky at my very first writer’s conference. She loved the idea. Too bad the story was only in my head, where it stayed for years as I wrote other books. I would start and stop PULLING HOME again and again. I eventually finished one version, sent it to an editor who loved the story, loved the writing and said it actually gave her goosebumps when she read it. Sadly, she couldn’t garner enough in house support to make an offer. That hurt. Still, I wasn’t about to give up. I respected this editor and she got my writing so I revised and re-sent. The rejection was kind but there would be no offer. And then, one August afternoon a few years ago, the same editor contacted me out of the blue, and wanted to know who my agent was and if I had anything to submit because she’d love to work with me. I could hardly think! I just knew PULLING HOME would find a ‘home’ with this publisher. By this time, I was determined to honor the real Kara (who you will read about at the end of this post) by getting this story in front of readers. Pass. Rejection. No thanks. Fill in the blank. I won’t go into my state of mind at that moment—let’s just say, it was a long and unpleasant pity party, but a few days later, I got down to the business of getting this book out. Myself. On my terms. To honor Kara. To the real Kara. A gentle and courageous warrior, who leads her life with faith, hope and purpose. Though PULLING HOME is a work of fiction, there is a real child named Kara who has Chiari Malformation & Syringomyelia. (The first time I heard these words, I had no idea what they meant.) I have known Kara since long before her first surgery and when I decided to write a book that would involve a sick child, I wanted to acknowledge this courageous girl by using her name and a variation of her condition. Everything after that is truly the result of my very overactive imagination. In case you were wondering about the real Kara….She was diagnosed with Chiari Malformation and Syringomyelia at age ten. Over the next eleven years, she underwent fifteen neurosurgeries and sadly, deals with chronic pain on a daily basis. Kara attends college for Deaf Interpretive Services and plans to become a Sign Language Interpreter. In her spare time, she plays guitar, writes music, paints, and is a freelance photographer. If you would like to learn more about Chiari Malformation and Syringomyelia, please visit http://www.csfinfo.org/. 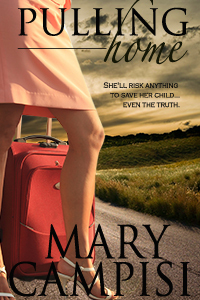 If you’d like to read more about PULLING HOME, including an excerpt, visit http://www.marycampisi.com/. Mary, not that you need to know what I think…but I believe you did the right thing! Sometimes the important thing is to honor our books and the characters in them, our talent, ourselves, and those who inspire our stories. You’ve done that. Be proud and smile. Life is good! Hi Mary. I have read A Family Affair twice this weekend and cried in half a different places. you have such a beautiful way of saying what people in love actually say and think. I loved it and it Will be a favourite story forever. thank you for sharing yr talent with the world. Thank you very much for taking the time to write to me. I am so glad you enjoyed A Family Affair and if it made you cry, I hope they were ‘good’ tears. I am very touched that you consider this one of your favorites. Thank you, Te, and best to you. I am so very glad you enjoyed A Family Affair – it means a lot when readers take the time to write me. I’m deep in edits of my next book, Paradise Found, so seeing your post was a very welcome break.